Join us for a afro-funky tribute to Hugh Masekela and Fela Kuti, two African music giants! Tickets go fast, tables go faster, so get yours now! 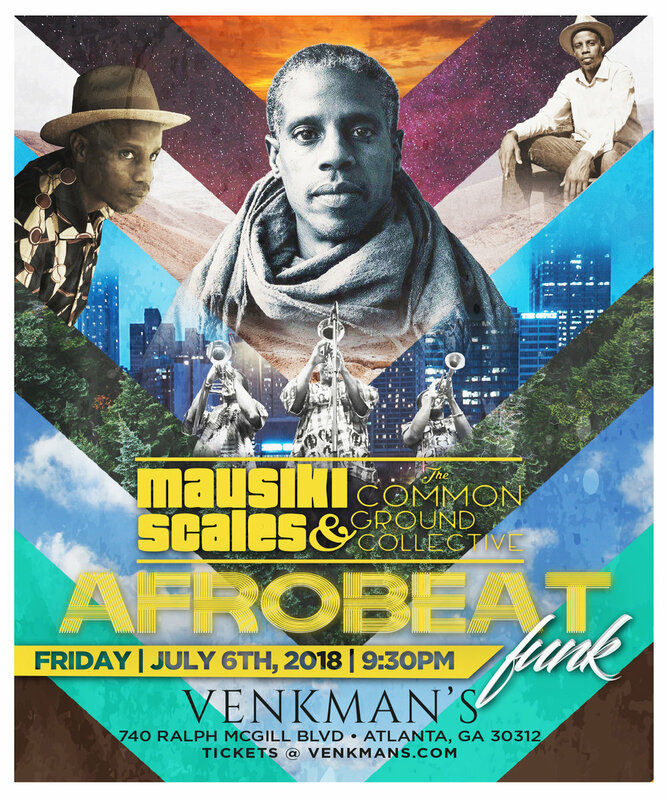 Join us for a night of Afrobeat, Funk, Samba and Soul delivered to you pure and uncut by Mausiki Scales & the Common Ground Collective and Khari Cabral Simmons. Tickets are going fast, so get yours today! Tickets are going fast, so get yours today at Ticketfly. Join us on Saturday, October 13, at Old Fourth Ward Park from 1pm to 8:30pm for the sixth anniversary of No Tables, No Chairs Parade & Concert! Be ready for a funk-filled exploration of the pulsating rhythms of the African Diaspora. Honoring the New Orleans-based tradition, we’ll kick things off with a ¾-mile second-line parade. And,this year, you’ll get a taste of the Caribbean with the Atlanta Junkanoo Band joining the line-up. Interested in being part of our marketplace? Click below to complete a vendor application. You already know...tickets go fast...tables go faster! Celebrate Fela Kuti with Jojo's New Afrobeat Collective, with Mausiki Scales as one of the featured guest artists. Join us as we celebrate the life and music of Hugh Masekela with a night of Afro-Funk, featuring guest performer, Mercy Myra. Tickets are going fast, so get yours today at Ticketfly. Join us for Hot Ice LIVE’s City Winery tribute to Funk giants , James Brown, Fela Kuti and Roy Ayers. Opening set from DJ Kemit. Great seats from $20. Doors open at 6pm; show starts at 8pm. Join The Common Ground Collective for No Tables No Chairs V (parade & concert)! This is a fully interactive musical experience!! This Funk Experience guarantees the removal of yo "shyness" and will make you "Get up off of that thang and dance til you feel better!!" Come participate in the 2nd line-Funk Parade! The parade starts at The Old Fourth Ward Skate Park. We'll tailgate from 12noon -1:30pm. Parade begins @ 1:30pm sharp!! Dress Afro-Futuristic-Funky and bring your tambourine and yo 2-step!! Check out the parade route here. Then, at 7pm join us at the Historic Fourth Ward Park Conservancy for an AfroFunk concert in the amphitheater! We're bringing the Common Ground sound to the Atlanta BeltLine Lantern Parade for the fourth year in a row! The Lantern Parade marks the beginning of the annual Art on the Atlanta BeltLine exhibition. Come walk with the band or just watch the amazing sea of lights and shout us out when we groove by you! Join us at Piedmont Park for the 2017 Atlanta Jazz Festival. We'll be on the Contemporary Stage serving up a funky fusion of Mausiki Scales and Common Ground sounds and dance performance by Giwayen Mata. Click here to find the stage location at the festival. Join us at the 7th Annual Music in the Park festival in historic West End! We'll be performing in the Apollo lot at 3pm. Mausiki Scales & the Common Ground Collective invites you to a fully interactive musical experience. Come join us in the 2nd line-funk parade in the afternoon and enjoy a Mausiki Scales & the Common Ground Collective concert in the evening. Funk, Jazz, Soul & Afrobeat have proven their ability to remove yo "shyness"!! Meet us at Old Fourth Ward Park (Next to "The Masquerade", North Ave) at 1:30pm. Dress Afro-futuristic-Funky and bring your tambourine and yo 2-step!! We will be in rare form!! Think 70s style bands like The JBs, Parliament, Mandrill and Earth, Wind & Fire; 2nd Line Jazz Parades in New Orleans; Afrobeat/Palmwine music in Nigeria, Highlife in Ghana; Calypso, Junkanoo/Carnival in the Caribbean; HBCU Marching Bands and yo grandmama's Church! Then, at 5:00pm join us for a Mausiki Scales & the Common Ground Collective concert at the amphitheater at Historic Fourth Ward Park. We're bringing the Common Ground sound to the Atlanta BeltLine Lantern Parade for the third year in a row! The Lantern Parade marks the beginning of the annual Art on the Atlanta BeltLine exhibition. Join us for good food and funky sounds on the patio of Le Petit Marche'. Mausiki Scales and Common Ground Collective perform at Gallery 992. WE'RE EVEN HOTTER THIS YEAR! Voted the Best “New Festival” by Atlanta Magazine in 2015, Fire in the Fourth Festival returns on Saturday May 21, 2016. The festival pays homage to the Great Atlanta Fire of 1917 that devastated the Old Fourth Ward 99 years ago on May 21, 1917.